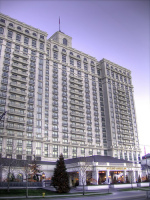 Rooms for the GEC are available in the Little America Hotel, in downtown Salt Lake City. Please see this page for details on room reservations, or go directly to the custom GEC6 reservation page. Sessions on Monday will be held on the University of Utah campus, 3 miles east of the downtown area. Detailed instructions are available for getting to these sessions with and without a rental car; a rental car is not required. Sessions on Tuesday and Wednesday will be held at the Grand America hotel, directly across Main street from the Little America. A catered reception will be provided by the conference on Monday night. Breakfast and lunch will be provided on Tuesday, and breakfast will also be provided on Wednesday. For other meals, there are a large number of options within a short walk of the conference hotels. The recommendations shown on the map represent a subset that are particularly recommeded by locals. Another list of good nearby restaurants can be found here. In general, if you walk north along Main Street, you can't help but run into plenty of places to eat. The map above also includes some farther-away options if you'd like to drive to dinner. For lunches, see the recommendations on the map above. Most of the "dinner" establishments listed are also open for lunch. The downtown area is also known for its cheap, delicious taco carts. On your way up to the University of Utah on Monday, there are a number of good places for lunch along the way, whether you are traveling by car or TRAX (also shown on the map). Another lunch options for Monday is the (high quality) student cafeteria a short distance east (towards the mountains) of the Officers' Club in the Heritage Center. Contrary to popular belief, it's not at all hard to get a drink in Utah. Several of the restaurants on the recommended list have good beer, wine, and liquor lists, and there are many good beers brewed in the state. There are several bars and pubs within walking distance of the conference hotels. All bars in Utah are non-smoking. A rental car is not required. 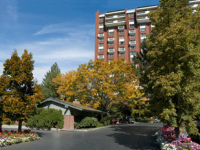 Parts of the conference will be held away from the conference hotel, at the University of Utah. Transportation to and from these locations can be done easily using a combination of the city's light rail system, TRAX, and GEC-provided shuttles. See this page for more information. Salt Lake City is (mostly) on a simple grid system. The origin of the coordinate system is at Main Street and South Temple. Main Street, on which the conference hotels sit, run north-south, and can be thought of as "0 East". A few important streets have names rather than numbers: eg. State Street is 100 East (one block east of Main), West Temple is 100 West (one block west of Main). You can generally orient yourself simply by looking for the most visible mountains: downtown and on the University of Utah campus, they are to the east. Google maps and some other map providers add extra directional identifiers before street names that you won't find on street signs: for example, what Google maps labels as "E 400 South" will be simply signed "400 South", and is said "Fourth South". The satellite imagery of Salt Lake City and the University of Utah is fairly far out of date, and does not accurately reflect the large constructions projects currently going on. A taxi ride from the airport to the conference hotel costs about $20 and takes about 15 minutes. There are also lower-cost shared-ride services available; these may require you to make arrangements in advance. If you wish to take a Taxi directly to the site of the Monday afternoon sessions, rather than the hotel, they are at 150 South Fort Douglas Boulevard. Should you decide to rent a car, rental car information can be found here, and driving directions to the Little America hotel can be found here. Most rental car companies are on-site at the airport. TRAX (map) is the light rail system in Salt Lake City. It can be used to get to the University of Utah campus, as well as to the downtown restaurant area. Downtown (including the conference hotels and stations near the recommended dinner restaurants), TRAX is free; there is no need to obtain a ticket. (free fare zone) Everywhere else (including the University campus), the fare is $2.00,and can be paid with cash or credit card via a machine on the platform. Tickets are checked at random on board the trains. The are three lines: University, Sandy, and Murray-University (which shares tracks with University and Sandy, skipping downtown). Trains on the University and Sandy lines run every 15 minutes until about 11:30 PM. Trains on the Murray line run every half hour until about 7:30 PM. The hotel is closest to the Courthouse station, which is on the Sandy and Murray lines. It is on Main Street, between 400 South and 500 South. The easiest way to get up to the University is to simply board a University train at the Courthouse station. You may also board one of the more frequent Salt Lake City trains at Courthouse, and transfer to a University train at the Gallivan station. The Gallivan station is also close to the hotel, and is the transfer point between the Sandy and University lines. Be aware that some van services may charge more than standard taxis.